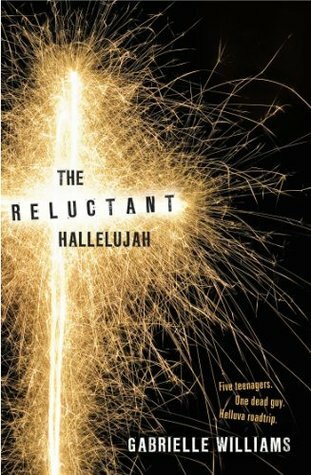 The Reluctant Hallelujah was one of those books that I’ve had a vague awareness of for a few years now. This awareness was pretty much in the sense of ‘I’m aware it exists but have no idea about the plot’, aside from vaguely knowing it had something to do with Jesus. But when I saw it sitting on the shelf at the library, I thought I’d give it a go. The story starts during one of Dodie’s last days of school, when her parents go missing. Not thinking much of it at first, Dodie assumes that there’s a reasonable explanation, until classmate Enron reveals that there might be something far more sinister going on. Next thing Dodie knows, she’s travelling through drains under Melbourne, driving unlicensed to Sydney and being pursued by bad guys desperate to get their hands on what Dodie’s parents were keeping in their basement, accompanied by her younger sister, Enron and two guys she’s never met – Taxi and the very hot Jones. I fell in love with Dodie’s voice right from the start. She was a gorgeously relatable character, which might have a little to do with the whole heading-into-year-twelve-exams thing, but the liveliness and gentle humour in her voice made me connect with her right away. Just the right amount of sass, without being overdone. I could very easily read several with Dodie as the protagonist. She was believable and realistically imperfect, and I’d totally take a road trip with her. I think the thing that made this book work so well was the real sense of fun that Gabrielle Williams created throughout the story. Given the cover and the title, I was a little worried what the preachiness-factor of this book would be like, but I was very pleasantly surprised by how funny it was. The absurdness worked so well, the ridiculousness of Dodie’s situation making the humour come very naturally. I was also pleasantly surprised by the irreverent sense of humour in the story – which was handled perfectly, I think because it was done with the right intentions. The religious side of things is there, but it’s not overwhelming. I wouldn’t call it a religious book, not at all. The relationship between Dodie and her sister Coco was something else that I really liked about this book. It felt really authentic, with the two girls acting like so many of my friends do with their sisters. The cared about each other, and they argued, and their relationship developed really naturally as the story went on. Probably the strongest character relationship in the story, as it was the one that was probably explored the most. Dodie’s relationship with Taxi was also quite interesting, and I think their friendship’s quite important. I think I actually enjoyed their friendship form and develop more than the romance between Dodie and Jones, mostly because there was a kind of honesty between Taxi and Dodie that was handled so well. Without going into too much detail, the ending of The Reluctant Hallelujah was done so, so well. Both sad and hopeful, I liked how it looked into what the aftermath of going through something like that would be. Life doesn’t just go back to normal for Dodie and her family, so I like that the story doesn’t just end on a hero’s triumphant return kind of scene. It all feels very honest, and like I said, sad and hopeful. The last few sentences of the story are absolutely perfect, and round up the story so well. The Reluctant Hallelujah is both funny and touching, and highly recommended to all YA contemporary fans looking for something a little quirkier than your average read. A definite 5-star novel.